In part 1 of this series we introduce the idea of using Virtual Humans as confederates in psychology studies. We looked at how Virtual Confederates can address many of the difficulties in using human confederates. What we have not yet addressed is all of the extra benefits that Virtual Confederates bring with them. In this part we will look at those extra benefits, with a bit of context from existing research. Scalability Getting more than a couple human confederates together for a study is hard. Because of this, experimental design is often hindered. Virtual Confederates scale well. Having 10 confederates entails more work in the design and programming, but not during the study. Having 100 confederates can also be accomplished. This opens new possibilities for future studies, particularly in social psychology. Dangerous situations cannot generally be studied as we cannot put the human confederates or participants at risk. However, virtual reality affords new possibilities, as no one will get hurt. 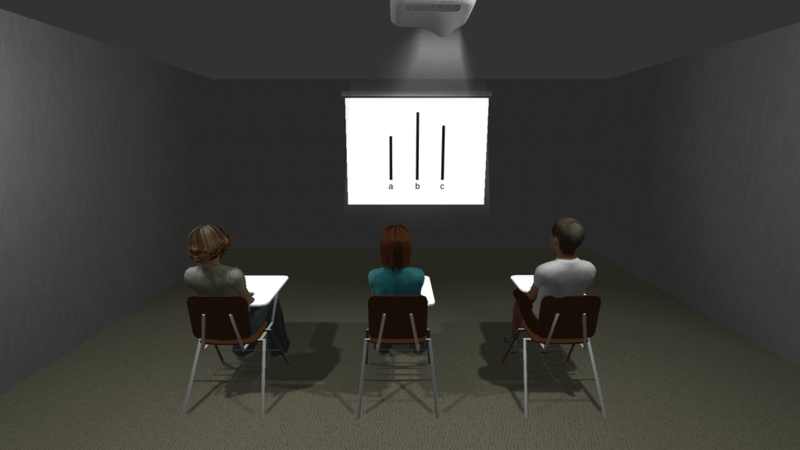 In the above image from a study from 2007 done by the Universitat Polytecnica de Catalunya, participants experienced a virtual fire breaking out in a bar with Virtual Confederates present. ECOLOGICAL VALIDITY Designing experiments often gets caught between two forces, the need for experimental control of all aspects of the situation and the need for an appropriate natural setting. Studies in the lab may not reflect the actions/reactions of people in a natural setting. Virtual Confederates are located in virtual environments, which can be nearly any setting. This means we can provide a high level of ecological validity while still expressing complete control over the situation. For instance, in a recent study at the University College London investigating Paranoia, participants were located in a crowded London Tube car as seen in the video below. Freeman, Daniel, et al. “Height, social comparison, and paranoia: an immersive virtual reality experimental study.” Psychiatry research 218.3 (2014): 348-352. Review/Debriefs Since our experimental setup is computer generated, it means we can review experiments or even debrief in a new and unique way. We can reenter the situation from any vantage point. Current technologies limit our ability to reproduce exactly the physical movement of the participant, but it possible even today. We could, for instance, literally put the participant in the shoes of a virtual confederate during the experiment. If the application is a learning oriented, such an in situ review may provide a strong insight to the user. As the entire thing is computer generated, we can also pause and “rewind” in the situation. Confederate Appearance can be strictly controlled for Virtual Confederates. This can enable things like changing appearance without changing any other factor. The motions, emotions, etc. all remain the same. For instance, a recent study by the EventLab at the University of Barcelona used this ability to investigate racial biases. Participants were exposed to people both of the same race and other race. The Virtual Confederates were also part of 2 groups, of which the participant was also, identified by changing the color of their blouses. An image of this is below. Peck, T. C., S. Seinfeld, S. M. Aglioti and M. Slater (2013). “Putting yourself in the skin of a black avatar reduces implicit racial bias.” Consciousness and cognition 22: 779-787. Virtual Confederates can go beyond this though. We can do things that are not humanly possible. We can manipulate the faces of the avatars, for instance to be more like the person. Below is an image from a study by the Virtual Human Interaction Lab at Standford University, where participants interacted with a Virtual Human that was an aged version of themselves. This led to self-reported changes in attitudes towards retirement savings. Virtual Confederates not only address most of the difficulties working with confederates, but also bring new possibilities to the table. These are exciting possibilities for research and for learning. Though this area is just taking off, it holds a lot of promise for the future.